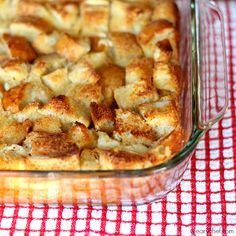 One day while I was perusing my news feed on Facebook, I saw a friend post about a French Toast casserole baked in the oven. I was intrigued. Yesterday I found myself on the Internet immersed in an amazing exploration of hundreds of variations on this theme. All recipes fill a 9 x 13 baking pan, but after that the differences are wide. Some are assembled and cooked right away - others are assembled the night before, stored in the refrigerator, then brought to room temperature and baked the next morning. The number of eggs used vary from six to a full dozen. Of those with cream cheese as an ingredient - some cut small cubes which are layered with the bread cubes, some beat the cream cheese into the milk/egg mixture and pour over the top, some use two 250 gram blocks of cheese and some only one. Added ingredients such as nuts or fruit also varied and one even created a coconut crust for the casserole. Maple syrup and sugar varied in amounts as did butter - all the way from none to a full 1/2 cup. After a lot of thought especially on exactly how much sugar and butter I wanted in this recipe, I came up with the combination below. It was all done the night before, sealed tightly with Glad Wrap and then chilled in the fridge overnight. When I arose, I set it on the counter while the oven pre-heated and then popped it in. As the rest of the family stirred, the smell of cinnamon wafted through the house. One note - the full tablespoon of cinnamon does give a cinnamon colour to the bread. I thought it was the right amount, my husband said I could have added more. At the table, everyone wolfed down a large piece with a smile. Always a good sign. I did originally used dried apples, but in talking with the family, it just didn't give enough apple flavor so switched the recipe to fresh. At some point I'm going to try the more sugary version with the coconut crust, but this less rich/sweet version suits my personal preference. And it's a trouble-free easy way to offer a special brunch to family and friends. Below is my current version, but I will be mixing it up in the future. Don't forget to look at other versions and do some of your own creating. The choice of bread is a great place to start. White bread makes for a softer texture - so you could try something crustier or even a Sourdough for a different taste. You can substitute a different fruit such as berries or peaches, or leave them out to be served on the side. The sky's the limit. Cube bread and cream cheese. (Note - most recipes call for 250 to 500 grams of cream cheese - too rich for my taste. I just cubed and added what looked right, about 3/4 of the 250G block.) Dice apples and pecans. Beat together eggs, milk, cream, maple syrup, cinnamon, vanilla and salt if adding. The cinnamon really didn't mix in well - not sure why - so I gave this mixture a few pulses in my food processor to blend it in better. Butter a rectangular 9 x 13 oven casserole. Place 1/2 the bread cubes in the bottom in an even layer. 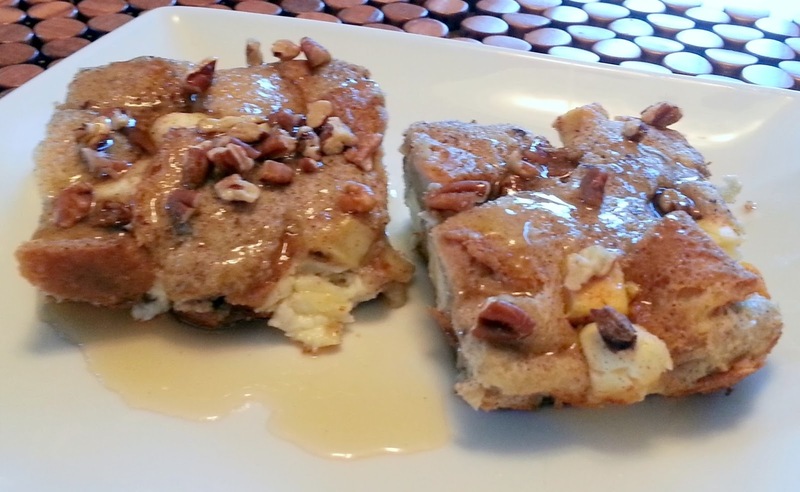 Top with cream cheese cubes, diced apple and 1/4 cup chopped pecans. Layer on the rest of the bread cubes. Slowly pour the milk/egg mixture over, trying to coat all cubes of bread. Top with last 1/4 cup of chopped pecans. Pat the top lightly to get the bread cubes down into the egg mixture. Seal tightly with Glad Wrap and store in the refrigerator over night. Take the casserole out and set on the counter. Most recipes suggest bringing it to room temperature before baking, but I didn't have enough time and it still turned out great. Preheat the oven to 350 degrees. When fully heated, put the casserole in the oven and bake for approximately 45 minutes until set all the way through. Remove from oven, slice into serving pieces, put on individual plates (warmed is nice if you have time) and serve with your choice of syrup.